Ensure you are connected to a solid wifi network. Attempting to download an update over an inconsistent cellular data network can often fail. Reboot your device by powering it off and back on again. We have often seen this resolve the issue. Log out of the App Store app on your device, and then log back in. Make sure you have enough free space available on your device to download the update. Make sure that you are logged into the App Store with the same Apple ID used to originally purchase the app. If you have since switched Apple IDs, you may not be able to install the update. You can switch back to your original Apple ID by scrolling to the bottom of the App Store Featured section, tapping on the Apple ID, and pressing Sign Out. Then sign back in with the correct Apple ID. Note: If you've previously been given a refund for this app, Apple no longer permits refunded apps to be updated. Please keep this in mind in case you are trying to update a refunded app. Download the Paprika update using iTunes on your computer. 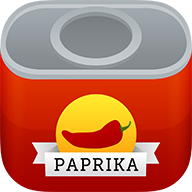 Connect your iPhone/iPad to your computer, and sync the new version of Paprika to your iPad using iTunes. If after trying all of the above solutions you are still unable to get the update to install, please contact Apple's App Store technical support directly for further assistance.